It’s the last day of October, All Hallow’s Eve. My pile is all about celebrating the faithful departed, the martyrs, hallowed saints, at least those of the vegetative kingdom that I lord over. Some Christians historically abstained from meat on the feast of All Hallows’ Eve, a practice my pile faithfully honors; others to this day still light candles on the graves of the dead. All in all, it’s a most fitting day to devote to the first big cleanup of the yard and in turn to bury the hallowed remains of the day and the season. Tricks and treats for the grave that is my pile. I step outside on a pleasant, sunny fall morning to hear the neighborhood abuzz with the sound of unseen small engines, blowing, mulching and otherwise engaged in the collection of fall leaves. Halloween has become a big holiday, held at a fine time of year and a rare modern tradition that still involves welcoming friends and neighbors, not to mention goblins and ghosts, to your home. Aside from stringing up Christmas lights or preparing for a Fourth of July barbecue, it’s the one time of year when you want your property looking its best. It’s also the last day of Daylight Savings time, and I’m already burning daylight. While the young hickory in the backyard clings to its shock of bright yellow leaves, enough leaves have fallen on the yard to begin fall cleanup in earnest. I take the middle ground and time my yardwork based on my weekly schedule, the work at hand, and the weather – and for special occasions like the hordes of costumed youngsters that by dusk will be clamoring up to my back porch to plunge their tiny hands into a bowl of wrapped candies, while their parents idle along the street and make the kids’ trick or treating a rolling block party. I have enough house pride to want my driveway and corner property to be safe and sound for the trick-or-treaters and presentable for the pub-crawling grown-ups promenading by. Some I recognize from the gatherings at the front-yard corner each morning, which serves as the neighborhood bus stop. I have appearances to keep up, after all. Besides, my pile has been waiting all season for this moment, the day when I raise it from the ground with the first wholesale contribution from the landscape it nurtures, not just with a batch of freshly fallen leaves, but some special treats as well. 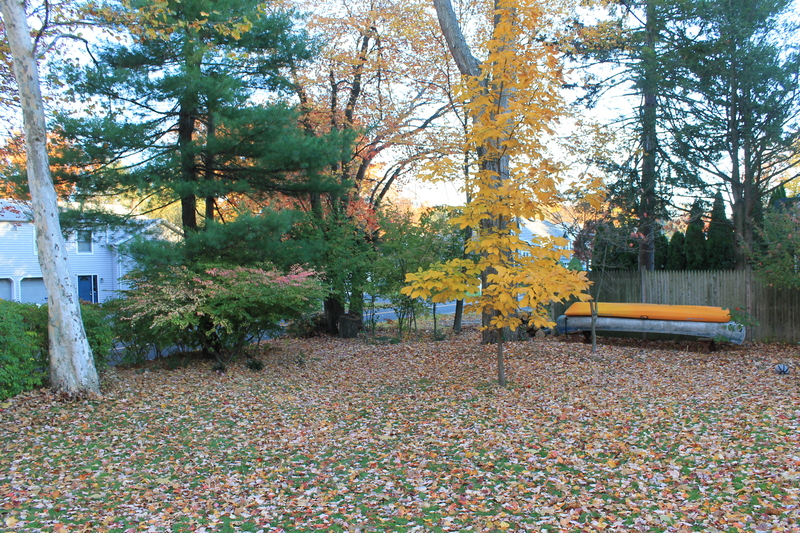 Despite a dousing of rain mid-week, most of the leaves of the trees in my yard remain stubbornly airborne. But enough have fallen gently upon the ground to make a day spent cleaning up a worthwhile yet manageable task. In short, today marks the peak of leaf-peeping season here in southern New England. If you have any time or inclination to be a backyard gardener who also composts, today is a hallowed day. I can’t wait to get started. Shredded paper and a helping of salt marsh grass harvested from the seashore will keep my pile airy under the coming crush of fall leaves. First I set out my ad hoc compostibles: Two more barrels of salt-marsh grass gathered from the local beach, two half-filled bins of scraps from my kitchen and the neighbors next door, and more shredded paper from the office. Do I spoil my pile with such lavishings? Perhaps, but all these treats are part of the waste stream that I produce at home, or bring home like a big bag of candy after a jaunt to the nearby seashore or farm. The big treat for my pile today is the lidded metal garbage can that I first began filling in September with layers of shredded paper, kitchen scraps and mature compost. It’s the second such helping of proto-compost I’ve kept on hand after dispersing last year’s crop of compost across the yard and garden beds. Pile or no pile, kitchen scraps and whatnot need a place to go, and parking them in a lidded metal can for a few weeks has worked out well for me and my pile this season. Two weeks ago I emptied the first garbage bin of proto compost into the initial crush of maple leaves gathered from the street and the neighbor’s front yard, mixing it into the tangle of tomato vines and spent stalks from the vegetable garden. It’s been a sweet Indian summer for both beachcombing and grass growing, and I’ve since nurtured my child prodigy of a pile with generous amounts of seaweed and salt marsh grass, clippings from the lawn and the choicest remains from the mountain of mulch from the previous week’s tree work in my yard. All the while the second can has been sitting tight beside the log wall that frames my pile. Every so often I’ve lifted the lid to peer inside, raising a small storm of fruit flies that reside within. But until this day my pile has not been large enough to absorb this second deposit of hot compost in the making. First I use the spring-tined rake to tease leaves from the fence edges backing the flower beds and from the pachysandra that surrounds the house like a green moat. I recognize the value of a leaf blower but have limited patience using one, so reserve it to quickly blast the leaves out from their resting places in the garden beds onto the grass where I can mow and mulch them. I use the mower to mulch the leaves on the lawn and drag the shreddings over to my pile. 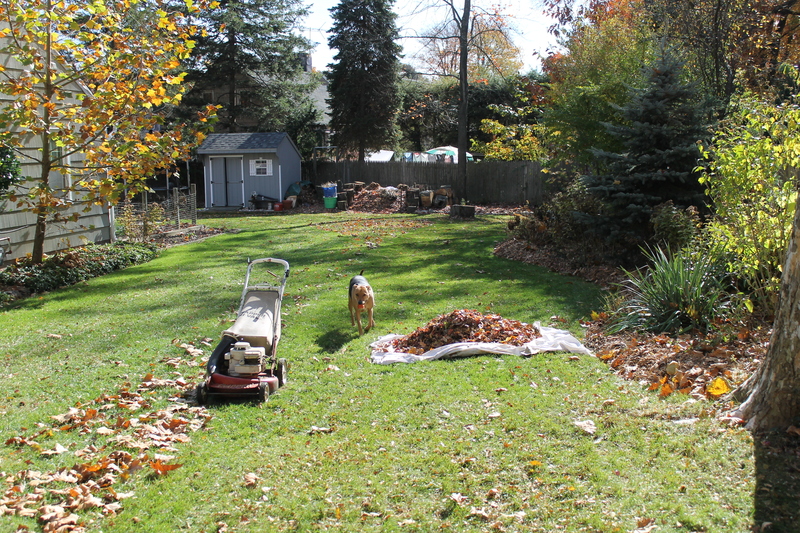 I fire up the Toro and make my way across the leaf-covered yard, vacuuming up 22-inch strips at a time. The wheels stumble across the many sycamore balls that still dot the ground. Most are too heavy for the whirring blades to vacuum up and dice but enough make it to seem as though the mower has turned into a popcorn popper, the tough nut balls pinging around the undercarriage. As the catcher fills with crushed material, I use the mower as a mulcher, nosing it through the thick layering of sycamore leaves. When the grass catcher fills, the Toro spits out leaves to the left, so I reverse course to disperse rows of freshly chopped leaves and grass clippings. Worms gotta eat, I tell myself, and mowing coarsely tidies the lawn of whole leaves, gives my pile an ample supply while leaving much mulch to grasscycle straight back into the lawn. Whenever the Toro chokes and stalls on too much leaves, I stop to empty the catcher onto my pile. After laying down two or three catcher fulls, I spread out the shredded paper, then empty the garbage can of proto compost across the top. It must weigh 50 pounds or more, and adding so much fecund compost starter to my pile makes me feel almost like I’m cheating, especially after I top it with heapings of dry salt-marsh grass stems and seaweed. This “compost in a can,” held in reserve until I had enough leaves to absorb it, will kickstart my pile. Never before have I taken such pains to layer the beginnings of my pile with such a diverse supply of raw material. 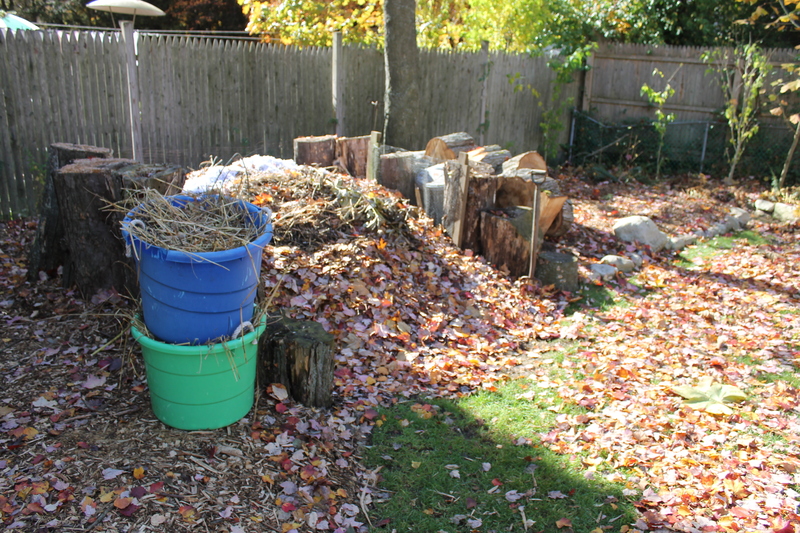 In years past, I would have been content to simply dump the leaves of fall wholesale onto my pile and then stuff it over the next few months with kitchen scraps. Bloom’s book paints a stark picture of a gaping problem in our society, both on the residential level and commercial scale, that composting seeks to address one humble backyard pile at a time. Such food waste is my secret sauce, a stew of energy-rich ingredients that will ignite my pile from within. The leaves give my pile volume, depth; the salt grass and seaweed added measures of air and further rich, green fodder. I finish up the mowing, stopping only so often to empty enough crushed leaves to cover my pile while leaving the yard thick with minced leaf litter. The grass remains a deep green and from the street looks fairly pristine, though I know from experience that I’ll be tracking flecks of leaves and grass inside the house for the rest of autumn. 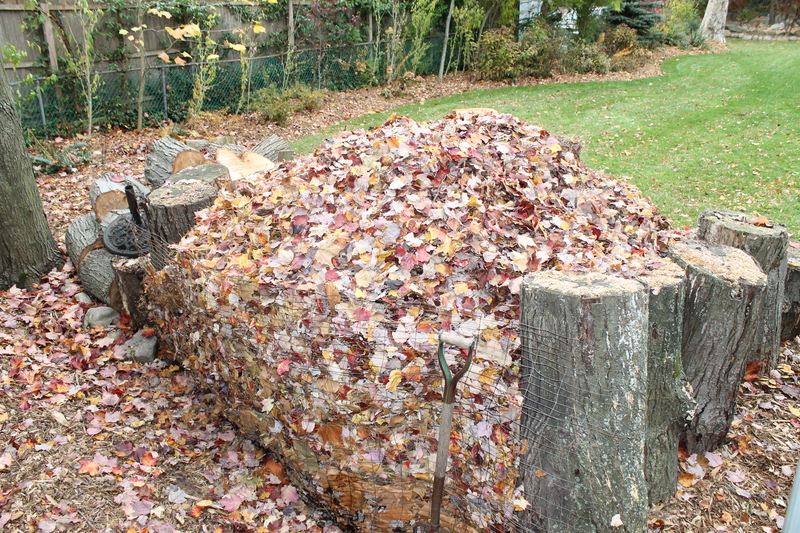 My pile, freshly stuffed, will settle into itself and be ready to take on the rest of the fall leaves. I end the Saturday yard chores by scooping up several sheetfuls of whole leaves from the street and neighbor’s front yard and dumping them directly onto my pile, then fire up the leaf blower for a victory lap around the property to tidy things up for the trick-or-treaters. At dusk, the yard is a snapshot of the peak leaf-peeping season in the suburbs of southwestern Connecticut. My pile is just getting started but already has all the makings of a fine heap of hallowed ground. A gardener is very much an editor. That sensibility has played out over a career largely spent writing and editing for a mix of national magazines. 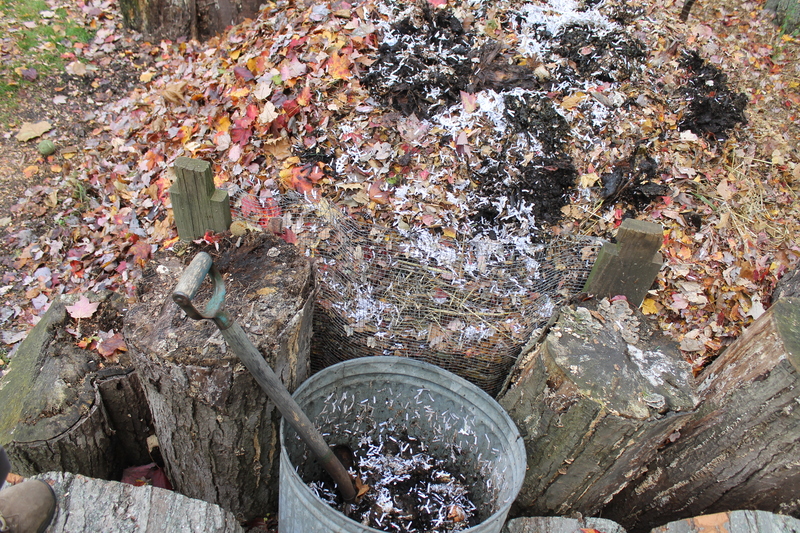 It also might help explain my fascination with the pleasure and the process that is composting. My pile begins as a load of raw if purposeful rubbish that over time and with some effort is refined into a finished product put to immediate use. As such, it is of incremental, temporary value, more ephemeral than lasting. A heap of fresh compost pales in comparison to a stately old beech tree that stands and delivers for generations; my pile is not literature; more like yesterday’s news in search of a better end than as bird-cage liner or a wrapper for Mr. Fortey’s fish ‘n’ chips. There’s no exact recipe for making compost; it’s a creative, unscripted act, yet its production plays out in a time-honored format and fashion. My pile is very much a magazine; at its root, the word refers to a collection or storage location, like a gunpowder artillery magazine. My pile is the Guns & Ammo of gardening. My vocation as an writer and editor and my avocation as a backyard gardener and composter go hand in hand. I often mull over writing projects while busying myself with the pruning and curating and transplanting that can keep a suburban backyard gardener preoccupied. I also sometimes plot out garden and landscaping projects while idling myself at work. I’ve kept a backyard compost pile since my days as a writer/editor with a food magazine in Los Angeles in the mid-1990s. It was a wonderful job in many respects, chief among them the twice-daily tastings in the test kitchen. Every recipe that ran in the magazine, and then some, were prepared in-house by our chefs, with assists from other staffers and guest editors. The tastings were held three days a week, the first at 10 am and the second at 2 pm. I was invited to attend not because I had much culinary expertise but because for much of my tenure at the magazine I was the designated male among an office-full of women. Maybe my boss figured that my taste buds, if not discriminating, were at least different enough to give me a seat at the table. In truth, the dishes were almost always delicious because the chefs could turn even the sketchiest handwritten recipe from some homemaker in Omaha into something to savor. I’d hang out in the test kitchen as much as I could, watching and listening and smelling all that went into their work while avoiding the stack of recipe transcripts and manuscripts in my inbox. This was in the early days of modern comfort food, just as the artery-clogging, cholesterol-laden recipes of old were being replaced by Mediterranean menus, featuring lots of vegetables simply prepared and seasoned not with rich sauces but with fresh herbs and garlic. Lots and lots of garlic. I ate amazingly well from 9 to 5, and couldn’t get a date for the better part of three years. I don’t recall how the subject of me taking home all the trimmings the cooks threw out each day came up, but once they knew of the modest compost heap I’d started in the side yard of the duplex I rented, they happily and conscientiously loaded me up with all the kitchen scraps I could take home at the end of each day. It was gourmet stuff – floppy green carrot tops and big bottoms of fennel bulbs. Pounds of flicked potato peels, whole volumes of papery onion skins. Lots of shrimp shells, as I recall — all in all, enough, usually, to fill two paper grocery bags every test-kitchen day. Each issue of the magazine included about 100 recipes, which every month found its way into a million or more kitchens. Food-waste expert Jonathan Bloom, writing in his blog, wastedfood.com, continues the math by reporting that 95 percent of the food waste produced in the U.S. that could be composted actually ends up going into a landfill or incinerator. Food waste accounts for some 28 percent of all this trash, though Bloom argues that the total amount of food wasted in the U.S. is actually closer to 40 percent when you take into account farm loss or waste between farm and retailer. Even though a minuscule amount of food and other organic material ends up being composted, overall the recycling or composting of organic material, including paper products and yard trimmings, “prevented 87.2 million tons of material from being disposed in 2013, up from 15 million tons in 1980. Diverting these materials from landfills prevented the release of approximately 186 million metric tons of carbon dioxide equivalent into the air in 2013—equivalent to taking over 39 million cars off the road for a year,” according to an EPA report Bloom cites. It didn’t occur to me at the time, but I suppose my LA compost pile offset its fair share of the smog I created driving back and forth to work each day, to help produce a magazine made of many acres of wood pulp. I lived in a Spanish-style duplex perched on a knoll at the base of the Hollywood Hills. On the edge of the back patio was a tall Ponderosa pine, its lower branches trimmed so the trunk branched upward and outward into a wide canopy sculpted like a statuespue standard poodle. It was a gorgeous tree, especially in the evening when the setting sun over the Pacific and across the Los Angeles basin nearly lit it from underneath, making its orange-red bark glow and the waxy green needles sparkle. A patch of ivy covered the slope below it, and there, in the bottom corner of the yard, I carved out my first compost pile, digging steps into the terraced hillside to reach it. Our landlord actually owned two properties on the narrow lot; our two-story unit and, behind it, a small bungalow that faced the next street over connected to our back patio by a pathway. The bungalow’s backyard was taken up by two old olive trees that shed copious amounts of long slender leaves and a rich rain of black olives. Alongside the duplex was a sliver of grass bordered by a boxwood hedge beside the walkway to the street. The tiny lawn gave way to a small rose garden perched above the street, with an impenetrably huge hedge of brilliant magenta bougainvillea fronting the sidewalk and running alongside the downhill side of the property. Though small and set on a hillside, the yard produced enough growth throughout the long California growing season to keep my compost pile in business. I especially liked scooping up piles of the day-glo petals of the bougainvillea to add to the heap, as thin as the breath strips you put on your tongue and just as fast to decompose. Profoundly spoiled by the chefs in the test kitchen, at times my pile was more kitchen scraps than yard refuse. It was a turbocharged stew of vegetable matter, with just a few rakefuls of pine needles, scratchy live-oak leaves, a dose of grass clippings and a dollop of homegrown rotting olives for me to contribute. My landlord was happy that I took ownership of the yard, and my downstairs neighbor was pleased, too, that she could clip flowers for her apartment as she wished, and happy to have me puttering about in the yard. Being a monthly magazine, we worked off an editorial calendar set several months ahead of real time. In October we tested our Christmas menus, which meant that our fattest issues hit at the tail end of California’s dry season and just before the winter rains began. The test kitchen worked overtime in those months, producing turkey after turkey to taste, and more important, all the trimmings for me to take home. Pound for pound, there wasn’t a more fecund compost pile in all of Los Angeles. I’d pitch my LA compost pile as two hours of a great movie, produced from miles of raw film. Over the course of several years of magazine issues, my gourmet compost pile helped turn a rented patch of compacted, hardpan dirt into a lush backyard oasis. When the fall rains came, the garden soaked up every drop, and the roses and bougainvillea and rosemary thrived in the California sunshine. And I became a composter.